A lawsuit by a group of American teenagers who claim the fast food chain McDonald's is responsible for their obesity has been thrown out of court by a New York judge. "It is not the place of the law to protect them against their own excesses," Judge Robert Sweet said, adding the suit failed to "allege sufficiently" McDonald's food is addictive. The lawsuit, filed by lawyer Samuel Hirsch in a Manhattan federal court, alleges McDonald's violated New York state's consumer fraud statutes by deliberately misleading consumers into thinking their products were healthy and nutritious. It says the company did not adequately provide information on the health risks associated with fast food, and the children developed health problems such as diabetes, high blood pressure and obesity from eating its products. Most of the teenagers lived on a daily diet of burgers and fries from the restaurant. The fast food industry and health campaigners have followed closely the lawsuit - the first obesity-related case against a food company to reach a United States courtroom. A McDonald's spokesman said "common sense has prevailed". "McDonald's has been providing nutrition information about our food for the past 30 years so that customers can make informed choices about what they decide to eat," he added. 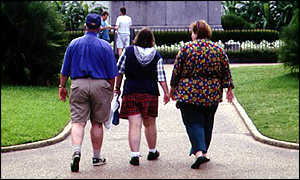 A recent assessment of obesity in the US found that more than half of all adult Americans are overweight. About 54 million adults were classified as obese - that is people who are about 15kg or more over the healthy norm, based on height - and hundreds of thousands of deaths each year are attributed to obesity-related diseases. The situation is so serious that President George W Bush has urged Americans to follow a fitness regime to assuage the country's spiralling health care costs. But the McDonald's ruling puts to rest fast-food companies' fears that the case could trigger a rash of further suits and huge payouts to victims - potentially running into billions of dollars - similar to those that have damaged the tobacco industry. Does my bum look big in this Boeing?